Welcome to today's issue of Login, now with thinner bezels and a faster processor. Modern smartphones are as powerful as many computers, so why not use them as one? That's the idea behind the Dex, a small docking station that turns Samsung's new Galaxy S8 into a computer by connecting it to a monitor and keyboard. It sounds like such a good idea. In practice, such efforts have rarely been a great success. With Dex, Samsung hopes it finally has a decent computer replacement. When plugged into the display, Dex is capable of running multiple apps, including mobile versions of Office in resizable windows. But while it can render desktop pages in its browser, it can't do Flash. Palm Foleo (2007) - never shippedWhen introducing it, Palm and Treo creator Jeff Hawkins called it the best idea he'd ever had. But the device, which turned a Treo into a computer, was canceled before it ever shipped. 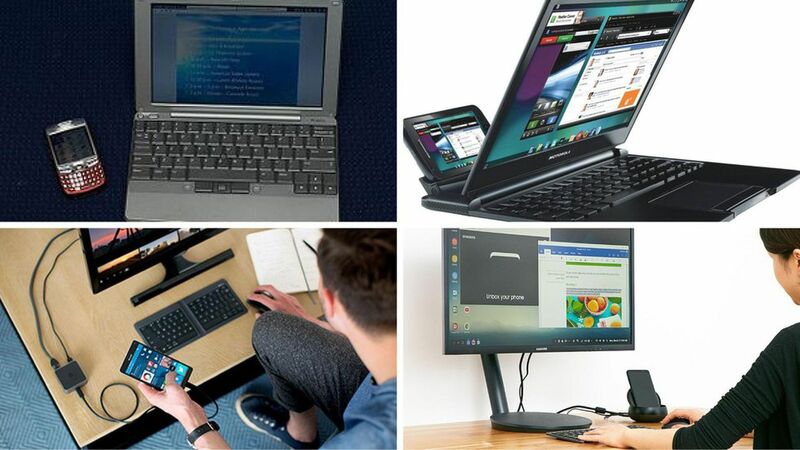 Motorola Atrix with Lapdock (2011) - very limited appealMotorola was the first to try the phone/laptop combo in the era of the modern smartphone, introducing the lapdock accessory alongside the Motorola Atrix, one of the early 4G phones. As others before and after it, the main issue was the fact that it couldn't really replace a PC in terms of either the breadth of software or performance. Microsoft Continuum (2015-present) - as yet unprovenThis one is actually still around, but you need a Windows Phone to use it. With Windows 10, Microsoft opened the door for phones to become a Windows PC just by plugging the phone into a mouse and keyboard. The catch here is that only new-style apps built for Windows 8 or later work. And you have to use a Windows Phone. Why it matters: Political and economic dynamics are forcing companies and investors to pay more attention to business activity in middle America, where many workers feel left out of the booming economies of the coastal cities (think San Francisco, San Jose, Seattle, New York and Boston). Following the recession, start-up formation stalled outside of the big tech hubs like Silicon Valley. But activity has picked up over the past two years, with some unlikely cities gaining momentum. Kim has more findings here. Uber released its first employee diversity report this week, and while Uber's reputation is particularly strained at the moment, its workforce demographics aren't all that different from those at other tech companies. White and Asian men still dominate the ranks of major tech companies, Kia reports. Why it matters: Lack of diversity — particularly for women, African American and Latino workers — is a systemic problem that Silicon Valley companies have actively tried to address. Despite these efforts, these firms have made only modest improvements in recruiting these under-represented workers for key technical and management jobs. What's better than a Jack in the Box Munchie Meal? One that's delivered to your door, as the fast food chain learned this fall through a temporary test in San Francisco with delivery service DoorDash. The companies are now expanding their partnership to 830 stores across 229 U.S. cities, including Los Angeles, San Diego, Las Vegas, Dallas/Ft. Worth, Houston, Phoenix, Seattle, and Denver. Restaurant chains on wheels: Jack in the Box is far from the first restaurant chain to hop on the delivery app craze. DoorDash also has partnerships with Taco Bell, Carl's Jr., Red Robin, and others. Postmates, one of DoorDash's main rivals, has its own partnerships with Chipotle, and its couriers can pick up orders from other merchants without partnerships (including Jack in the Box). Why it matters: Just a few years ago, food delivery apps seemed like a luxury for the rich tech workers building them, but today they've become an important tool for restaurants to maintain their revenues. McDonald's recently detailed for its shareholders a new plan to use delivery as a means to spur growth, and has partnered with Postmates, UberEats, and others to test delivery options. Pam Edstrom was not only Microsoft's first PR person, but her name came to be synonymous with the company's communications strategy. The firm she co-founded — Waggener Edstrom — has spoken for Microsoft for decades. But now, its most passionate and feisty voice is gone. Edstrom, 71, died Wednesday after a four-month battle with cancer. "We probably argued as much as we agreed over the ten years we were together," recalled Corey duBrowa, a former agency president, who now heads communications for Starbucks. "But I loved her all the same. How many people can you say THAT about?" DuBrowa remembered her as fiercely smart and a varsity-level human. "Having her a couple of cubes down from me every day meant knowing that I was playing in the big leagues." On Tap: Steve Case hosts his "Rise of the Rest" Summit on Capitol Hill....The Commerce Department will announce the carrier to help build a nationwide public safety broadband network (AT&T is expected to be awarded the 25-year contract). Trading places: Erie Meyer, co-founder of U.S. Digital Service, is joining the leadership team of Code For America....Terry Blanchard, an engineering manager for Apple's mail app, has joined Readdle to head up development of Spark, its iOS email program. ICYMI: Rover.com and DogVacay are combining to create one big dog in the petsitting/dog-walking market....The Oscars said its accountants at PWC will no longer have access to their cell phone backstage, following this year's Best Picture mixup....Worth reading is Motherboard's profile of hacker Runa Sandvik, who is now director of information security for the New York Times' newsroom. Watch actress Scarlett Johansson compete in Virtual Reality Pictionary on the Tonight Show with Jimmy Kimmel.